ACA has worked closely with J. Rotherham Masonry Ltd, a progressive stonemasonry company based in Holme on Spalding Moor near York. ACA have devised an industrial master plan for the exciting expansion of their company. The project promises to improve the infrastructure of the area, complement the vernacular of the rural surroundings and bring employment to the area. 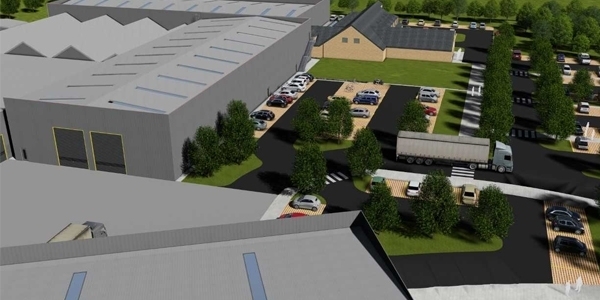 The phased industrial master plan comprises of an office block, café, gym and other facilities that will enhance J. Rotherham Masonry Ltd’s position as ‘Employer of Choice’. The site is located on an old airfield in the heart of the East Yorkshire countryside. The external design has been carefully formulated as a response to the building size, location and context. The main factory development will be fabricated using a ribbed metallic cladding that will absorb the colours of the surrounding landscape. The future office block development will connect to the large monolithic factory building. The appearance of the office block will be achieved using a combination of architectural stonemasonry and metallic cladding panels. Using a clever combination of contemporary, ergonomic and biophilic design, the internal design will create a healthy, welcoming and happy workplace. ACA have been consistent and reliable in managing the process of our phased masterplan scheme. The team have brought innovation and value to each stage and always deliver to their word. The 3D video of our project looks fantastic and is remarkably helpful to visualise the space. Congratulations to ACA on achieving this, it sets a very high standard for the practice.